Admittedly not the best of my food photos but I wanted to do a first impression review of The Palace Buffet that opened on April 1st, 2015 in Vernon CT.
My husband and I were just driving by on a Saturday afternoon when we noticed the flags billowing in the wind a new sign on the storefront so we took a little detour. Paulie went in to check it out while I was vlogging in the car. Upon his return a few minutes later, he gushed at the beautiful sushi on the buffet and said the next time we were in the mood, we should try this place. Little did I know that the mood would strike us just few hours later, well perhaps 5 or so. We arrived around 6:30 pm on a Saturday night. The parking lot was looking full and the neon was primed in the setting sun so we were ready to take a taste. Any resemblance to the prior restaurant have been wiped clean, it's a much sleeker venue with shiny black tables, glass inserts between booths with the logo and on arrival you are greeted with a formidable Buddha statue clad in red and gold. It's even roped off like you're in a museum but a sign in from of it encourages you to take a photo in from to get a discount off your meal (no we didn't do it but by the 4th it was down to 10% off). I was tempted to post the photo on Social Media to get the mug, alas, I didn't. The feel inside, well, how do I phase this accurately? Cafeteria, perhaps I felt that way because of the layout. The buffet itself is at the back of the location with seating in the front and a semi private room off to one side of the entry for parties or large bookings. The tables are a shiny black 'lacquer' which appear more practical. The geek in me couldn't help but guess at the cost of all the new tables. The chairs are basic but comfortable and there was ample space between tables to prevent elbowing your neighbours. Tables are preset with paper napkin wrapped utensils, the fork's tines all still perfectly straight (sorry couldn't help myself, it's a pet peeve of mine when dining out). A couple of semi-concealed beverage nooks on either side of the dining area where the most petite servers I've ever noted, milled around refilling and chatting in native tongue. Our drink order was taken as we sat down but didn't appear until a couple of reminders. I think there is a bit of a language barrier and Paulie's root beer was initially understood as ginger ale (no idea how, they don't even sound remotely similar). I got my standard unsweetened cold green tea which was tasty but did not have the expected hint of sesame. 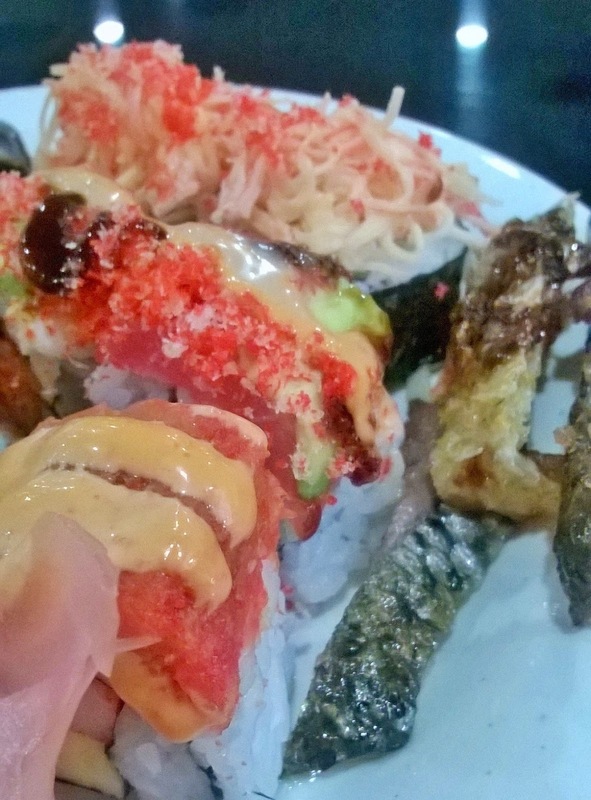 I was lured to try most of the rolls, each decorated in a squirt of something or avocado or shredded faux crab. The rolls were pretty but when I started tasting them something was missing. It wasn't till I asked Paulie what he thought it dawned on me. Each of the rolls were devoid of anything crunchy - no cucumber, asparagus or the lovely crispy panko we're accustomed to. In the end, each roll was indistinguishable, they had similar flavors even if they differed in colors. On the other hand, the sashimi was spectacular - quickly seared peppered tuna, flounder and crispy salmon skin (my fave!). The desserts were predictable fruit, mass produced cream puffs and the ever present jello (I apparently lack the understanding why it's on so many Asian buffets). 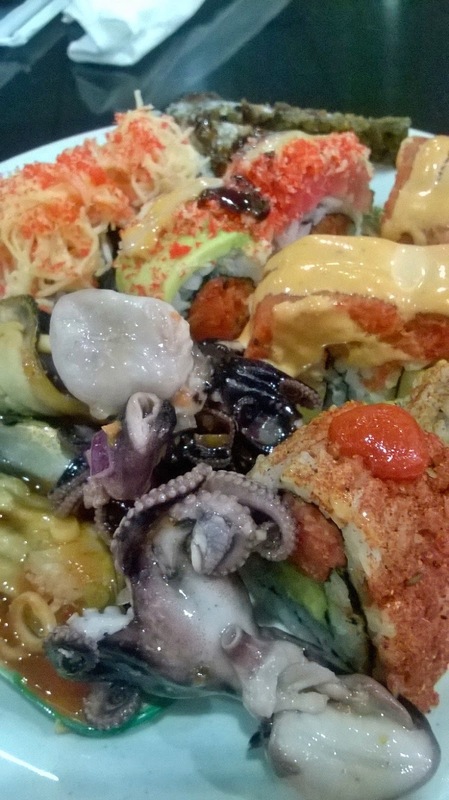 Overall, we'll return to try other items on the buffet and in part see if the quality and size of the sushi will continue to be the same or diminish as so many buffets tend to do.